way you make the kitchen smell of home. I love the way you are neither soup nor stew, sauce nor purée. Indeed you hold a texture all to yourself, soft, soothing, silken. A little nubbly sometimes. You heal more rapidly than arnica. You put the world to rights even before you reach the table. Earthy and aromatic, as you simmer; the air steamy with cumin, garlic, black pepper. I don’t need to dilute you with rice as others do. To me you are enough, just as you are. and garlic and spiked with paprika and turmeric. Of all the dried beans and lentils from which it can be made, the yellow split pea is the one that works best for me, breaking down just enough to give a texture poised between soup and mash. Others work too. Good as the pure, classic method is, today I fire things up, adding both freshness and a teasing punch. 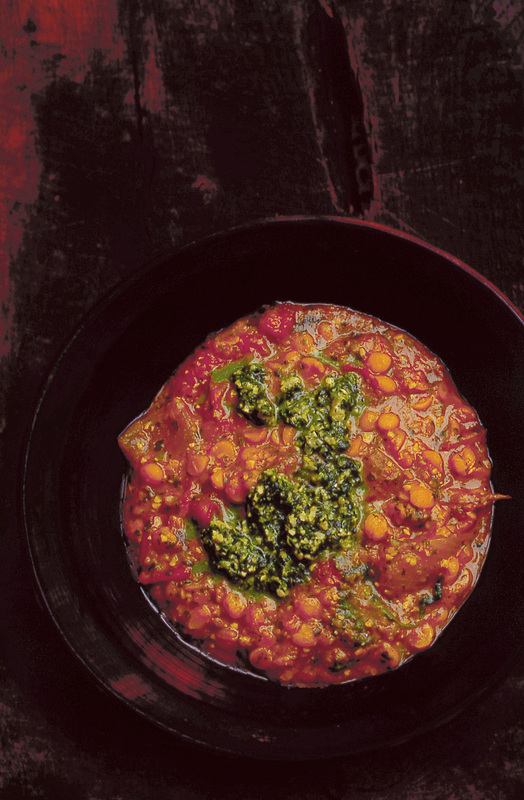 This time, I give the earthy note of the spiced split peas a dash of homemade coriander and basil paste. The result is spoon after spoon of warming, golden dal and the occasional flash of brilliant green herb paste. Food to comfort and hug, yes, but also to dazzle. Love indeed. Recipe taken from Nigel Slater’s A Year of Good Eating: The Kitchen Diaries III. Rinse the split peas, then cook them in deep, unsalted boiling water for about thirty minutes, till soft and tender. process to a rough paste, then set aside. cook over a moderate heat till deep gold and translucent. cooked split peas and five heaped tablespoons of the herb paste. Stir in the coriander leaves. Serves 4 generously. The spare paste will keep in the fridge, covered, for three or four days.